Proteck Carpet & Tile Cleaning is a carpet and tile cleaning service in Delta, Colorado that offers a variety of services including Carpet Cleaning, Tile Cleaning, Steam Cleaning and much more. We strive to offer great service while keeping our rates affordable. Our workers are highly skilled and courteous when working in your home. For a great service in Delta, Colorado call on Proteck Carpet & Tile Cleaning. The tile and grout in your home is often a challenge to keep clean. The grout seems to get dirty as soon as you are done cleaning, and no matter how hard you scrub, it never looks as good as it once did. 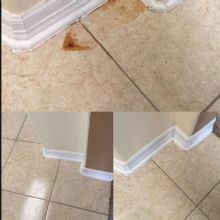 The problem many homeowners are not even aware of is those cleaning solutions that you are using to attempt to clean the tile and grout are actually making it worse. Here are some benefits to using a professional tile and grout cleaning service in your home or business. When your are scrubbing the grout in between the tiles, you could actually be causing more damage than good. Chemicals that contain bleach actually break down the composition of the grout, making the pores larger than they were before you began cleaning. When you scrub the tiles with a chemical that contains bleach, your attracting more dirt in a shorter period of time. The larger pores mean larger pieces of debris can easily become trapped in the grout, making it appear dirtier even faster. Proteck Carpet Cleaning specialists only use organic cleaning compounds that will never harm the grout in between your tiles. The team at Proteck Carpet Cleaning will scrub your tiles and your grout so they look as clean and fresh as they did the day they were installed. 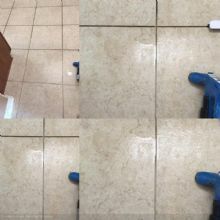 The the team will apply a coating to the grout to lock in that clean appearance and help to keep bacteria and mold from easily getting trapped in their again. The end result is your tile and grout look cleaner for much longer. Your carpeting might look clean to the naked eye, but if you were to take a closer look you would become concerned with all the dirt, debris, and contaminants trapped in those carpet fibers. The bacteria and allergens make their way into the home by way of the bottom of your shoes, and easily become trapped deep down in the carpet fibers. The only way to have those items removed is with vacuuming regularly, but many home vacuums are simply not up to the task. The bacteria and allergens trapped in the carpet are difficult to remove with a store bought vacuum. If mold has already begun to spread from moisture in the carpet, the only way to successfully remove it is with a professional carpet cleaning service. The team at Proteck Carpet Cleaning have the tools and the expertise to remove those contaminants quickly the first time. The first thing the specialists at Proteck Carpet Cleaning with do is use an organic cleaning solution to loosen all that dirt and debris from the carpet fibers. Once loosened, the team with them use high powered truck mounted vacuums that will effectively remove all the bacteria and allergens quickly from your home. The Proteck Carpet Cleaning experts will then treat your carpet with a protectant designed to make sure any future spills or debris do not get trapped deep down in the carpet before you have a chance to access it with your vacuum. Regular scheduled cleanings will ensure your home is safe from bacteria and mold so it does not hurt the respiratory system of family members. Craig & Tanya, Delta, Co.
We called them last minute. They returned our message (several others didn't). They arrived at the time we appointed. They were fast! They were really nice and we could tell they were really happy to be here helping us out. The carpets look great and they dried pretty fast, just like Tina said they would. Great service, great team, very professional! So efficient and just awesome to work with! Would recommend again and again!